How does Honda develop their world-renowned small engines? It takes an effort spread across research and development facilities across the globe. Borrowing design tools, materials and other developments across the company, engineers both here and abroad work to make sure that each engine fits their applications and each application fits their engines, even if they aren’t made by Honda. Honda introduced their first general purpose engine just 5 years after opening their doors, and they started making waves in 1954 with its follow-up, the four-stroke T-type. In a market dominated by two strokes and big diesels, this engine stood out for its ease of use. It was first used in backpack sprayers shipped to Brazil, but the engine would find its true place in the domestic market. With more people heading to Japan’s cities to find work, farmers needed a way to do more work with less manpower. Demand for labor-saving devices skyrocketed, leading Honda to start building their own small-scale farming equipment. From that point forward, the small engine division and the power equipment division were linked. While other engine manufacturers acted independently, Honda was able to find and address issues in their engine designs by developing them side-by-side with equipment. This can be seen in their entry into two markets: compact generators and lawnmowers. Sony introduced their portable Micro-TV in 1962, leading Honda to develop an equally tiny generator prototype to use this portable television on the go. Seeing the potential for such a device, they launched the world’s first compact generator, the E300, in 1965. To get this new design to work, they designed a new 50 cc engine specifically for the application and in the process introduced the world’s first timing belt. 50ccWith the release of their first mower in 1978, they introduced a unique blade brake clutch system that would shut off the blades if the operator lets go of the handle. This made the mower safer and ended the hassle of restarts required with competing systems. This feature is still built into some of their lawn mower engines today. Honda’s small engines start their development at the small equipment lab at Honda R&D Co, Ltd, located in the outskirts of Tokyo. Sitting between two elementary schools, this small office building houses everything you’d expect to see in an automobile development lab, but on a smaller scale. Advanced CAD and simulation software is used to develop prototypes which are put through a battery of tests on-site. These tests include everything from cold weather testing in a room that has artificial snowfall to a high-temperature room that can stress and prematurely age engines to quickly identify the sources of common breakdowns. The quietness of Honda’s engines is the result of tests in an anechoic chamber. It blocks all outside noise so engineers can isolate and identify where noises come from inside the engine. These designers are able to use production techniques and materials developed in Honda’s labs across the globe. In the U.S. alone, Honda has 14 research and development centers working on everything from jet engines to new materials. Honda also performs final small engine development for North America at a research center in Haw River, NC. Established in 1993, this 11,000 square foot facility makes sure each model can tolerate our widely varying weather conditions while meeting emissions standards. When an equipment company wants to use a Honda engine in their products, they don’t just order a few units and bolt them on. Instead, they go through a development process with Honda to make sure the engine and equipment are fully compatible. First, the manufacturer contacts a regional distributor. Together, they work out what engine will best fit the application as well as pricing, availability, technical requirements and other issues. Once the manufacturer knows the basics, they can build a Honda-powered prototype. This equipment is then tested at the Haw River lab to make sure the engine will work properly. This includes factors like oil temperature, vibration, operating speeds and engine loads. Wiring and mounting systems are also inspected to make sure they’ll be reliable. Want to maintain the quality engineering of your Honda small engine? When you need parts, visit www.hondalawnparts.com. As a certified dealer, we’re able to offer the full line of OEM parts, letting you keep your engine running just like it did when it left the factory. Our site even has factory information including parts descriptions and exploded diagrams so you can quickly find what you need. We ship across the U.S. and Canada. Buying a pump is easy, but it can be a lot harder picking the right hoses. Which hose materials should you choose? What about thread compatibility? What’s the difference between a basket strainer and a skimmer strainer? Here’s what you need to know to choose the right combination of parts to fit your needs. The optimum hose length is the minimum you need to get the job done. As length increases so does flow resistance, which can reduce your pump’s performance. Intake hoses need to have an internal structure to resist vacuum forces. PVC hoses are good for general use, while EPDM is more abrasion resistant, making it a good choice for trash pumps. Discharge hoses have to withstand outward pressure, but these stresses are much lower than those experienced by the intake hose. Basic lay flat hose has a low-pressure rating, typically below 80 PSI, and is intended for pumping water downhill or across flat surfaces. When pumping water over slight inclines, look for a hose with at least a 150 PSI. As with intake hoses, EPDM lining is the best choice for trash pumps. Keep in mind that pressure ratings for all hoses are based on an operating temperature of 68ºF. Maximum pressure will decrease in higher temperatures, so it’s better to err on the safe side if you regularly pump warm water. Pin lug ends use threads like a garden hose. These usually need to be tightened down with a large spanner. Hoses typically come with threads on both ends so multiple hoses can be connected using to get the right length. All Honda pumps have pin lug threads on the intake and discharge openings. Camlock ends use a quick connect system with two cam arms that fold in to lock the hose in place. This allows the hose to be connected and removed without the use of tools. Camlock adapters can be added to threaded connectors, including the openings on your Honda pump. There are two widely used thread standards on water and trash pumps: NST and NPSH. NST is National Standard Thread, another name for NFPA 1963. This thread is common on firefighting equipment. NPSH is National Pipe Straight Hose thread. It’s slightly smaller in diameter than NST, and it has more threads per inch. This thread is commonly used on water and trash pumps across the industry, including Honda’s pumps. Both threads are straight, so they don’t self-seal like tapered plumbing threads. To make the connections water-tight, a separate seal must be added to the face of the connector. A strainer covers the opening of the intake hose to block materials that are too big for the pump to handle. Hole size should be chosen based on the maximum debris size your pump can handle. As for materials, plastic works well for regular pumps, while metal can withstand impacts from large debris drawn in by trash and diaphragm pumps. Basket strainers work well for general use, while skimmer strainers are best for completely draining bodies of water. These have a low profile to pull in water until it’s almost gone without starving the pump. When you need OEM parts and accessories for your Honda, visit www.hondalawnparts.com. We have both complete boxed hose kits with everything you need to start using your pump and individual parts so you can build hoses for specific requirements. You can see what we have to offer on our pump accessories page, or enter your pump’s model and serial number to see parts and kits that will fit your equipment. Need parts for your pump’s case or engine? Our site can show you factory diagrams and descriptions so you can get exactly what you need. No matter what you order, we can ship it to any address in the United States or Canada. Honda’s GHX50 is easy to overlook, but this tiny engine has managed to make its way into products ranging from home generator to mining equipment, and it’s even found a niche in motorsports. What is it that makes this 50 cc engine popular with hobbyists and professionals? 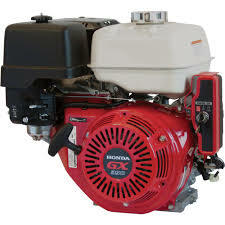 Although Honda sells it as part of their mini four-stroke series, this engine doesn’t have the oil baffle system that lets engines like the GX25 and GX35 operate at any angle. Instead, it’s intended for use in applications where it will be kept upright. As the “GX” name implies, this is a professional quality engine, sharing many design features with larger models in the lineup. This starts with an overhead valve design with an 8.0:1 compression ratio. This helps the engine generate 2.1 hp at 7,000 RPM and, 2 lb-ft. torque at 4,500 RPM, while a wide torque curve lets it run effectively at lower speeds to conserve fuel and keep it from bogging down during heavy loads. The onboard 0.8-gallon tank can keep the engine running for about 4 hours. An automatic mechanical decompression system relieves cylinder pressure when turning over the engine. Combined with the low weight of the piston and valvetrain, the engine is extremely easy to start. It also uses a float carburetor instead of the more finicky diaphragm carburetors usually found in engines of this displacement. Like larger engines, the GHX50 comes with a carburetor drain plug and an oil drain plug so the engine doesn’t need to be tilted to drain old oil and fuel. An automotive-style paper filter protects the engine from fine debris, while an optional spark arrester makes the GHX50 legal for use in areas prone to fire. Most servicing is done at 50 hr/6 months and 100 hr/1 year intervals. The piston is connected to a forged steel crankshaft supported by ball bearings to ensure years of trouble-free use, while the Oil Alert system shuts down the ignition if the oil level is too low, protecting the engine from premature damage. Like Honda’s other engines, this motor is both CARB and EPA certified, making it legal to buy and operate across the U.S. and Canada. The entire engine including the muffler and fuel tank measures just 8.9 x 10.8 x 13 inches and weighs just over 12 lbs. without fluids. This makes it a great choice for applications where weight and size are at a premium. If a piece of power equipment needs to be carried by hand, there’s a good chance someone has made a version powered by this engine. While used in a variety of equipment, its most popular application by far is in water pumps, whether they’re built for draining mine shafts, irrigating farmland or fighting fires. 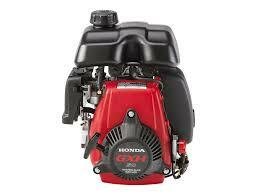 Honda uses the engine into its own WX15 lightweight water pump and EU1000i inverter generator. The GHX50 may seem out of place next to superbikes and race-prepped NSX’s, but the company considers it to be one of its most important offerings. Most racers start their climb through racing series at a young age with go-karts, including most of the current F1 drivers. Even three-time world champion Ayrton Senna started his career behind the wheel of one of these karts. Seeing dwindling interest in Junior Karting due to high engine costs, Honda Performance Development created a kit to adapt the GHX50 to kart use. The engine’s industrial roots make running costs extremely low: despite being constantly pushed to its limit, it can last well over 200 hours between rebuilds. This gives young racers a chance to get the thrill of racing with a safe level of power that lets them hone their skills. This has also drawn attention from other hobbyists, adapting the engine to motorized bicycles and minibikes. It’s small enough to fall within displacement restrictions in most areas for road use, and since it’s completely self-contained, there’s no need to worry about routing a muffler or fitting a fuel tank. Best of all, it’s far more reliable than the two strokes usually used in these applications. No matter what your Honda engine is powering, you can get quality OEM parts for it from www.hondalawnparts.com. We’re a certified dealer for Honda Engines and Honda Power Equipment, letting us ship parts for their products across the U.S. and Canada. Not sure what part you need? Our site has built-in factory diagrams so you can see exactly what you’re ordering and where it fits on your engine. Looking for a tiller that can do it all? Honda’s F220 is a mid-tine model that can be set up for two tilling widths, has an engine that can handle tough soil better than compact two strokes, and uses a drive system to take the strain off the tines and the operator. This model uses Honda’s GXV57 engine. While it may be small, it shares the same basic design as Honda’s larger commercial engines. This includes features like an automotive-style paper air filter that provides better protection and needs less frequent maintenance than foam filters. Small displacement motors don’t need much force to turn over to begin with, and with this engine’s automatic decompression system, the starter pull is as light as a feather. Honda has led the way toward the switch from two to four-stroke engines to meet tightening emissions regulations. This switch doesn’t just help the environment, it also brings major improvements to usability. There’s no need to mix oil with fuel, and the engine is far less sensitive to fuel degradation. The GXV57’s wide torque curve keeps it from stalling when the tines run into compacted dirt, and if it does stall, it’s much easier to start. Honda fits the tiller with a steel bar that wraps around the engine, protecting it from impacts during operation and transport. This model has a maximum tilling width of 21 inches. If you need to work around borders or small plots, the outer tines can be removed, reducing the width to 12 inches. At full throttle, the tines spin at 138 RPM. The mid-tine design places the engine weight directly over the tines, helping push them into the soil. That’s 58 lbs. of force that doesn’t have to be exerted by the operator. The engine has an integrated transmission with one forward speed. Since it doesn’t have to rely on the tines for momentum, they can do more cutting, giving this small tiller the power to slice through clay and compacted soil. 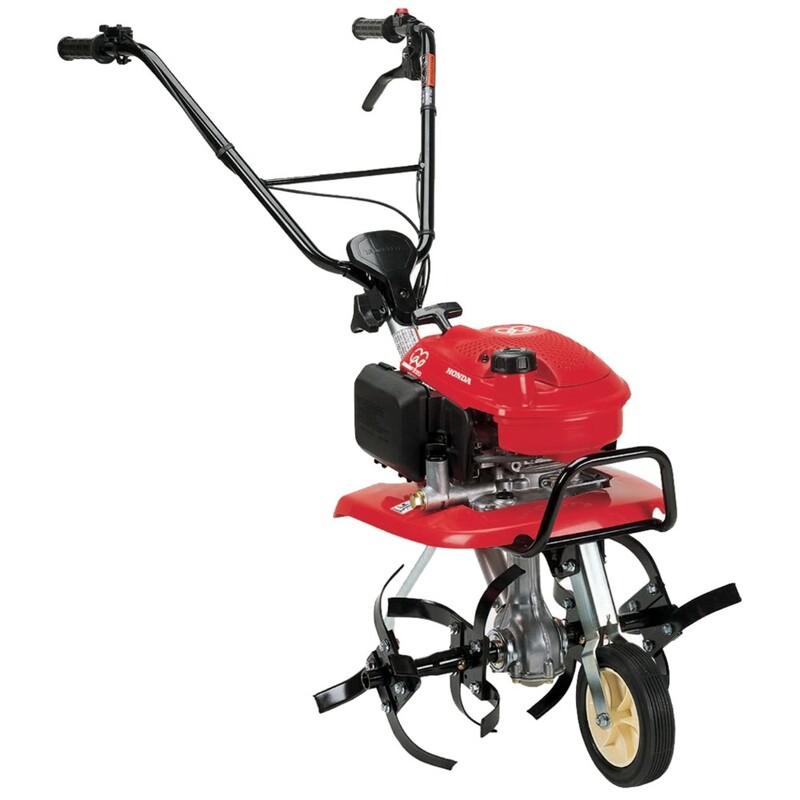 Honda offers optional side discs that deflect dirt away from plants and pavement for easy cleanup, while the furrow attachment makes a V-shaped trench for planting. The handle on the F220 can be set to three positions, giving the operator a comfortable hand position with the right amount of leverage. A front-mounted retractable transport wheel flips up and down with minimal effort. When the wheel is down, the handles can be lifted to roll the tiller around the yard. Once the tiller is in the work area, the depth bar can be adjusted to limit how deep the tines dig. This creates consistent planting beds, even when the tiller is moved between gardening plots. After the work is done, the handle can be folded forward, making the overall package compact for easy storage and transport. This tiller and its engine are covered for two years of residential use or one year of commercial or rental use. 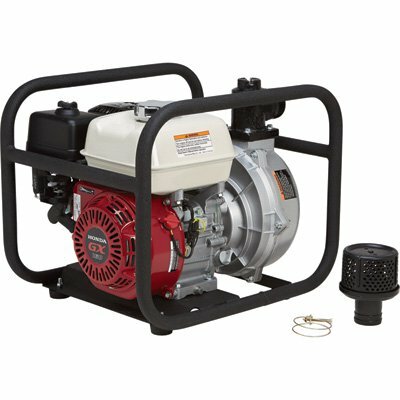 Hondalawnparts.com is more than an online parts warehouse: we’re a certified dealer for Honda Power Equipment and Honda Engines so you can be sure you’ll always get quality OEM replacements for your tiller. Our site can search by your model and serial number and will show you factory parts diagrams and parts descriptions so you can be sure you’re ordering exactly what you need. We can ship your order to any address in the U.S. or Canada.